Transparency Market Research (TMR) has published a new report titled ‘Catheter Stabilization Devices Market – Global Industry Analysis, Size, Share, Growth, Trends, and Forecast, 2018–2026.’ According to the report, the global catheter stabilization devices market was valued at US$ 1,115.0 Mn in 2017. It is projected to expand at a CAGR of 5.6% from 2018 to 2026. The global market is anticipated to expand at a relatively rapid pace during the forecast period, due to implementation of guidelines by government organizations. High prevalence of cardiovascular diseases and urinary Incontinence among the geriatric population, growing prevalence of lifestyle-associated diseases led by adulterated food, booming research and development of technologically advanced catheter stabilization devices, increasing number of clinical surgeries, and developing health care infrastructure are expected to fuel the global catheter stabilization devices market during the forecast period. North America is likely to account for a major share of the global market during the forecast period, owing to strong presence of major players with established distribution networks in the region. The catheter stabilization devices market in Asia Pacific is projected to expand at a high CAGR from 2018 to 2026. Catheter stabilization devices, also known as catheter securement devices, are often used in cardiac surgeries, dialysis procedures, cancer treatment, and general surgeries. Use of catheter securement devices reduces chances of needlestick injuries and catheter-related complications during a surgical procedure. Health care-associated infections is a major threat to public health. Considering the increase in incidence of health care-associated infections across the globe, it is required to understand factors influencing the severity of these infections and the best possible treatment options for them. Catheter-associated complications and infections is a key factor responsible for health care-associated infections. Public and private sources are focused on reducing the prevalence of chronic disorders by spending on medical products and services in health care settings. In developed countries, physicians and governments have started educating the general public about hospital-acquired infections and their adverse effects. Several agencies are providing funds to research organizations in order to promote innovations in technology, which can be utilized in the manufacture of new-generation catheter stabilization devices. These are more effective than traditional catheter stabilization devices in limiting catheter-associated infections. This is likely to augment the global catheter stabilization devices market in the next few years. In terms of product, the global catheter stabilization devices market has been classified into CVC stabilization devices, PICC stabilization devices, abdominal stabilization devices, chest drainage tube stabilization devices, and others. The CVC stabilization devices segment is projected to account for a major share of the global market during the forecast period. The segment is anticipated to expand at a steady pace from 2018 to 2026, owing to the availability of promising, effective, and efficient CVC stabilization devices for accurate securement of central venous catheters (CVCs). 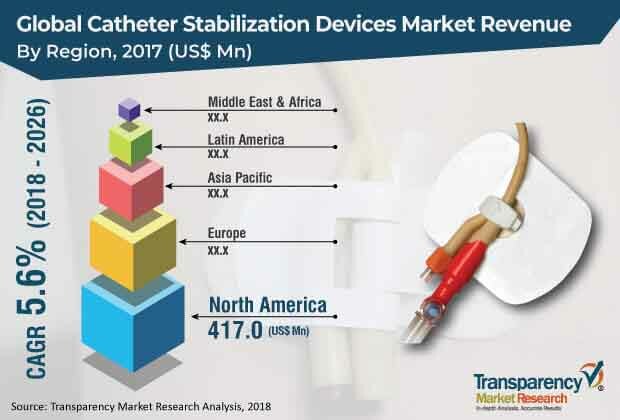 The global catheter stabilization devices market is witnessing a shift toward development of new catheter stabilization devices in order to ensure elimination of hospital-acquired infections. The abdominal stabilization devices segment is expected to expand at a rapid pace during the forecast period, due to the increase in investments by manufacturers in the development of low-cost and innovative abdominal stabilization devices. Based on end-user, the global catheter stabilization devices market has been divided into hospitals & ASCs, diagnostic centers & clinics, home care settings, and others. The hospitals & ASCs segment is projected to dominate the global market between 2018 and 2026, owing to patients’ preference for hospitals and increasing government involvement in the development of hospital infrastructure across the world. The hospitals segment is expected to expand at a remarkable CAGR during the forecast period. North America and Europe accounted for a significant share of the global catheter stabilization devices market in 2017. This can be attributed to high health care expenditure, high rate of catheterization for treatment of chronic diseases, such as chronic kidney disease, led by increase in the prevalence of lifestyle-associated diseases; rise in awareness about significance of catheter securement; high market penetration of newly developed catheter stabilization devices; favorable reimbursement policies assuring business growth for new market entrants, and presence of major players in the two regions. However, changes in reimbursement and insurance policies in 2017 and stringent regulatory framework for production of medical devices in the U.S. are likely to hamper the catheter stabilization devices market in North America in the next few years. Asia Pacific is likely to offer significant opportunities to the catheter stabilization devices market during the forecast period, owing to an increase in the geriatric population, rise in the adoption of catheter stabilization devices led by awareness about their advantages, and surge in the incidence of hospital-acquired infections in the region. The global catheter stabilization devices market is dominated by a few major players, which account for a major share of the market. Increased per capita income is boosting the buyers’ power in terms of adoption of catheter stabilization devices. These key players are projected to dominate the global market during the forecast period, owing to their strong worldwide presence and established distribution networks. The report profiles leading players such as M. C. Johnson Company, Inc. , B. Braun Melsungen AG, C. R. Bard, Inc. (Becton, Dickinson and Company), 3M Healthcare, ConvaTec, Inc., Smiths Group PLC, Merit Medical Systems, Inc., Centurion Medical Products, TIDI Products LLC, and Baxter International Inc.